A Tuesday tongue twister or tasty non-trout treat? Slammin’ Sammamish Salmon Sandwich fits both bills. I know, I know fish don’t have bills…they have lips! There is an enormous run of Salmon this year coming past our islands headed toward the Fraser river in Canada to spawn. The salmon run is exceptionally good with numbers of fish expecting to reach as high as 20 million individuals. Our local reef netters snagged 15 hundred fish a few Thursday’s ago (reef netting is an ancient art of fishing developed by the indigenous people of the Pacific Northwest). Beautiful, healthy, bright Sockeye Salmon! Our friend Sam gave us about 5 pounds worth of glistening fish. This easy sandwich is a good way to use up extra Green Goddess Dressing (from post 8/23/10). The creamy, herb spread does well as a tarter sauce substitute. Heat oil in a cast iron skillet over medium- high heat. Sprinkle fillets with salt, pepper and dill on the flesh side. 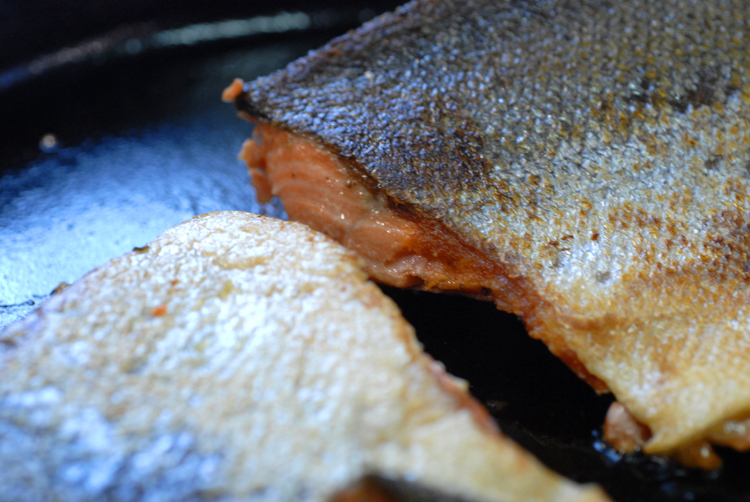 When oil is hot place fish skin side down, if the fillets are thick consider using a lid for more even cooking. After about 4 minutes, flip the fillets and continue cooking until cooked to desired doneness. 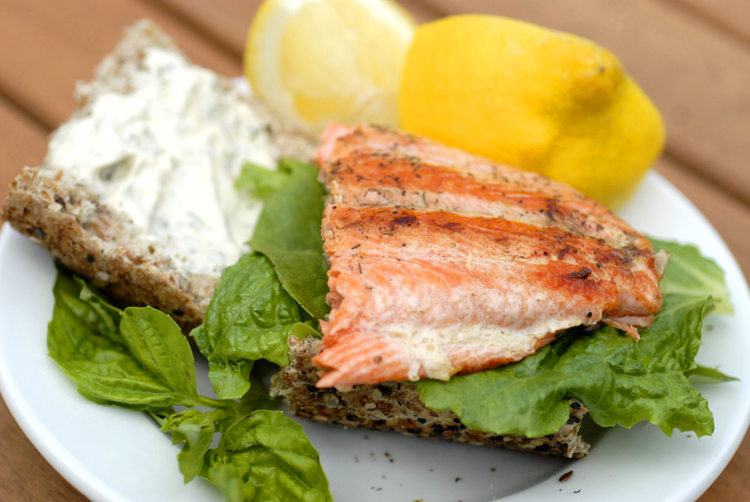 Assemble sandwich and drizzle fresh lemon juice over the salmon. This entry was posted in recipes and tagged salmon, sandwhich by MixedSoup. Bookmark the permalink.